2016 Missouri Woodgas Meetup | Doniphan, MO | Sep 29 - Oct 1 - Events - Drive On Wood! The 2016 Missouri Woodgas Meetup will be held at the Ripley County Fairgrounds in Doniphan MO, from September 29 to October 1. This is a beautiful area on the Current River, rafting/kayaking is very popular. The fairgrounds itself is large and has several buildings. Dry camping onsite, no RV hookups. There are some good campgrounds nearby (see below). Another area attraction is Big Spring, an hour from Doniphan. Greg suggested we may want to take a trip up to see it. 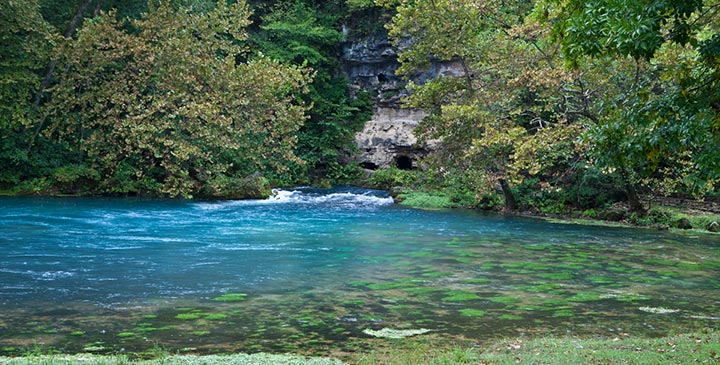 “Big” is an understatement… it is one of the largest springs in the world. Doniphan is a town of 2,000. They have a McD’s, Subway, Sonic, as well as some local eats. Two local grocery stores, several auto parts stores including NAPA. Poplar Bluff is 30 miles away, for Walmart, Home Depot, etc. Dry / tent camping is available onsite. RVs welcome, but no water or electric hookups. There are some excellent campgrounds and motels in Doniphan, even more in Poplar Bluff but no need to go that far out. Want to Convert Motorcycle to Woodgas, NEED ADVICE! Couldn’t make it to argos this year. I am only 125 mi from Doniphan, I might be able to help out with something. 202 miles. About 4 hours. Sounds good. 200 + miles. Planning to be there. Will let Raymond from MO-Gasification Systems know. He has been wanting to get together with DOW folks for some time now. Updated with new info. See first post. Correction!! There are spots to camp at the Ripley County Fairgrounds, but no camper hookups there at the fairgrounds, if there are any questions please ask. Thanks Greg. I’ve updated the post. Is there a fee to camp onsite? 666 miles…not sure about this one. Hay Joseph, got your truck goin’?? Sorry I couldn’t come help you, life gets in the way sometimes. I do! Well it should be going by this weekend. Building up the char bed as we speak. Just have to add some hay to the filter and it will be ready for the road. Grandin is my home town it just 12mi from Doniphan. No there is no fee there is only a few outlets for extension cords and what not, we have restrooms but only one shower. Bump. Only one more month! Please RSVP. Bump… Only two weeks left! Tried getting to the spreadsheet but no luck. Right now I plan on coming. Will be on dino though. Thanks Chris for putting Tom on the list. Will miss you Wayne and Lisa. We will have wood for who needs it. If anyone needs any special size wood let me know soon!! I am bringing the chunker and gasifier! It’ll be a long drive, and I will likely be setting off from South Carolina after work, stopping at Wayne’s for some sleep, and continuing onwards early. So, I’ll be there at least for part of Saturday, but if I get off work early then Friday too. Will be headed out Sunday morning, driving back to Frankfort then onwards to Mendota… in time for work Monday morning. Long weekend! But that’s how much I love you guys!! We will have poles, strips, and slabs to chunk! Thanks for coming! Be careful during your travels! !